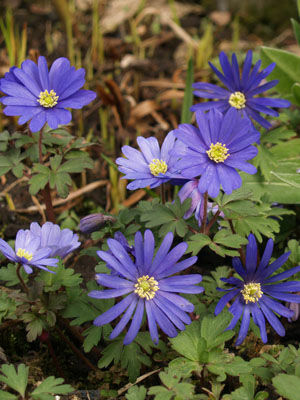 Use large-flowered anemones as feature plants in the summer garden. Hardy spring-blooming anemones are ideal companions for tulips. Soak the hard roots in water overnight before planting. Set out dormant roots in autumn where they are hardy, or in early spring, planting them 8cm (3 inches) deep. Plant in groups of three or more.Soak the hard roots in water overnight before planting. Set out dormant roots in autumn where they are hardy, or in early spring, planting them 8cm (3 inches) deep. Plant in groups of three or more.